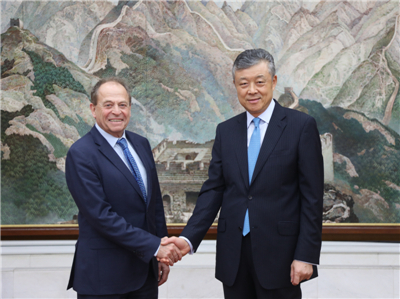 On January 7, Ambassador Liu Xiaoming met with Stephen Perry, awardee of the China Reform Friendship Medal and Chairman of the 48 Group Club, at the Chinese Embassy. Ambassador Liu extended his warmest congratulations to Perry on being awarded the China Reform Friendship Medal recently, saying that the award to outstanding international friends who supported and assisted China's reform and opening up is of great significance. Three generations of Perry's family have been committed to promoting China-UK exchanges and cooperation in economic, trade and culture, making huge contribution to China's reform and opening up and China-UK friendship. Among the 10 awardees of the medals, Perry is the only one from Britain to receive this well-deserved award. Perry said that the medal is a great honor for him and his family, and he cherishes it greatly. When he visited China with his father in the early years of China's reform and opening up, China was still poor and backward. Over the past 40 years since reform and opening up, China has undergone enormous changes, and its remarkable achievements, which he admires greatly, have attracted worldwide attention. He feels honored to be part of the great historical progress. He is looking forward to, and feels confident about, China making new achievements by further deepening reform and expanding opening up. The 48 Group Club is committed to enhancing the exchanges and cooperation between China and the UK, so as to make new contribution to China's reform and opening up in the new era. 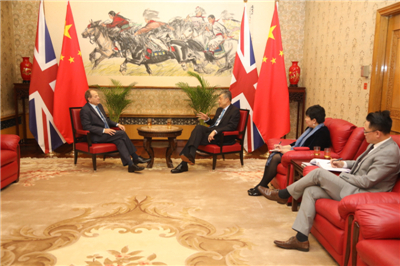 Ambassador Liu noted that, as President Xi Jinping said, China-UK friendship has strong popular support in both countries, and it is the consensus of the governments and peoples of the two countries to build China-UK "Golden Era". The Ambassador expressed the hope that people from all walks of life in China and the UK would carry forward the spirit of the "Icebreaking trip" from generation to generation and work closely for a steady China-UK "Golden Era".